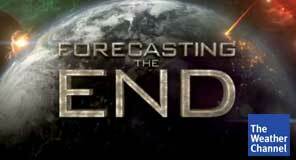 I’m pleased to report that I had the opportunity to consult on (and occasionally appear in) an astronomy/geoscience/climate science crossover project for the Weather Channel this past year, entitled, Forecasting the End. The show, which premiers this evening, uses extremely-low-probability astronomical or geophysical disasters as a hook to explore and present astronomy, geology, meteorology, and physics concepts in a novel (and admittedly fantastic) way. Of the six-episode series, the first deals with the concept of so-called “rogue” planets, a timely subject of recent research. Many astrophysicists, astronomers, and exoplanetologists have set their research sights on puzzling out exactly how it is that new star systems go about forming planets, (in this case “exoplanets,” or planets outside our solar system). Interestingly, the fruits of their labor have in recent years led to the realization that the process is a frequently violent one. -So violent, in fact, that during the gravity tango performed between a fledgling solar system’s new planets, one of these “dancers” is thrown right off of the dance floor. Any one of these escaped exoplanets, then, becomes a “rogue” planet – left to wander the cosmos along its lonely escape trajectory for billions of years. 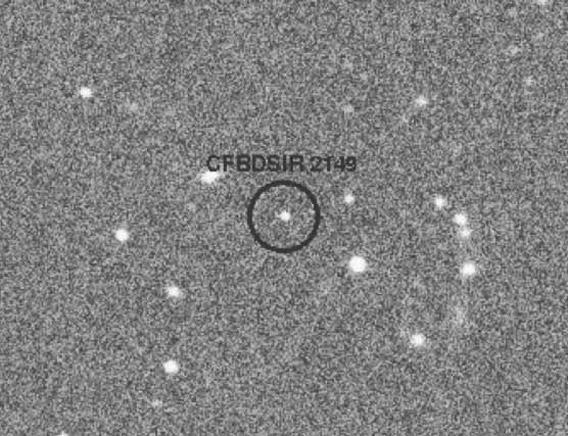 Astronomy-savvy readers may recall a splash last year when researchers reported calculating that there may be billions of these dark, lonely worlds wandering the galaxy. However, as the “giggle-check” champion astronomer Phil Plait of “Bad Astronomy” fame was quick to point out, compared to the amount of free space in the galaxy, the odds of a collision with these seemingly innumerable rogue planets – any collision – are mind-bendingly slim. Hence, while the Forecasting’s exercise deals with a disaster that is legitimately statistically possible, it is a threat far less likely than, say, being hit by a meteorite. Or winning the lottery three times in a row. Instead, the rogue planet has a different, more sublime function. It can help us tell a story, and in the telling, learn a little bit more about the Earth. By exploring the “What if?” scenario provided by the idea of a rogue planet breezing through our solar system, we have the opportunity to illuminate a seemingly-unrelated and often misunderstood phenomena at work much closer to home (and – for the “aha” moment – much more relevant to traditional weather): Seasons. The cosmic roots of our annual swing between months spent shoveling snow and sunning on sandy beaches may not be at all intuitive. However, this reality becomes much easier to grasp in terms of a cosmic disaster. 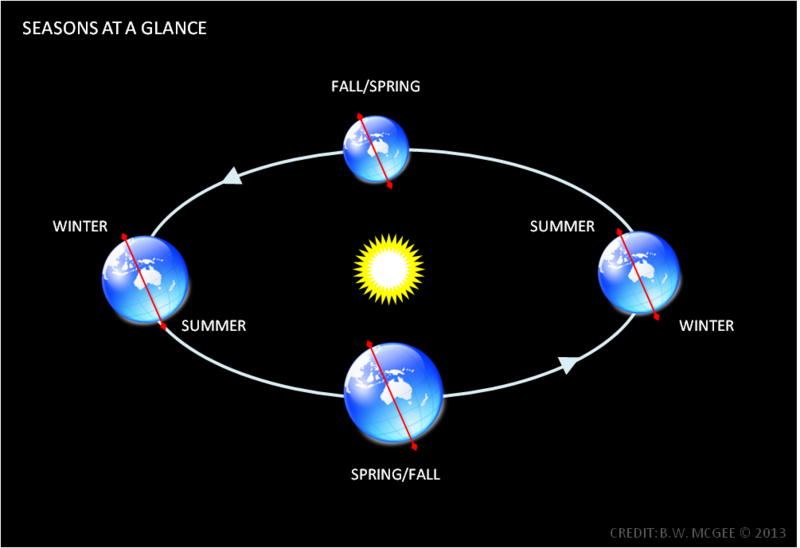 Many (intuitively) misunderstand why it is that the seasons exist at all, believing logically that summer is when the Earth is closest to the Sun, and winter is when we’re farthest away. This is actually not the case. Why not? Simply, because the Earth’s orbit is almost perfectly circular, there really isn’t that much difference between the heat received by the Earth at closest and farthest approach to and from the Sun. Consequently, summer is when your side of the Earth (northern or southern hemisphere) is pointed toward the Sun, and winter is when your side of the planet is pointed away. Such an event turns the previously-mentioned misconception (that seasons are caused by distance with respect to the Sun) into fact for life on Earth! 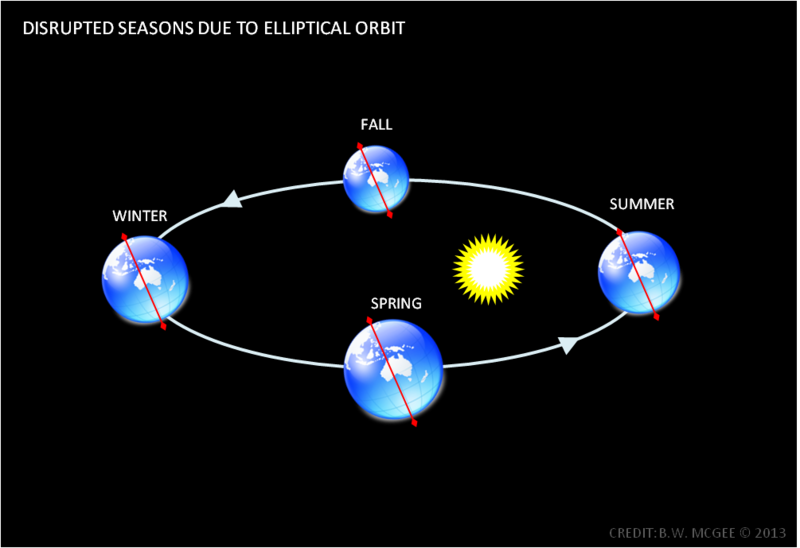 In such a scenario, the shape of Earth’s orbit becomes more oval (ellipse) than circle, and it travels much closer to and farther away from the Sun during its yearly course (aphelion and perihelion) than it does now. As a result, seasonal changes due to the Earth’s axial tilt are totally overwhelmed by the global swing in temperatures based just on proximity to the Sun. NOTE: These effects were actually scientifically modeled on Earth by Penn State astronomer Darren Williams and paleoclimatologist David Pollard in an effort to explore the habitability of worlds with more elliptical orbits around other stars and were published in the International Journal of Astrobiology in 2002. This paper, which formed the conceptual basis for the effects depicted in this episode, can be found here. Aside from the tantalizing (for space scientists) or terrifying (for everyone else) infinitesimally-remote specter of some sort of interaction with a rogue planet, this episode provides a a roundabout and extreme way to drive home a simple truth: Astronomy relates directly to weather. The knowledge that the study of the universe beyond can help us understand life at home is a powerful one, and the take-home truth (to me) of the rogue planet episode is that orbit shapes and axis tilts work to define the temperature (weather) for any world orbiting a star. -And today, because our orbit is not elliptical, it is the tilt of our axis that dominates our climate and causes our seasons. 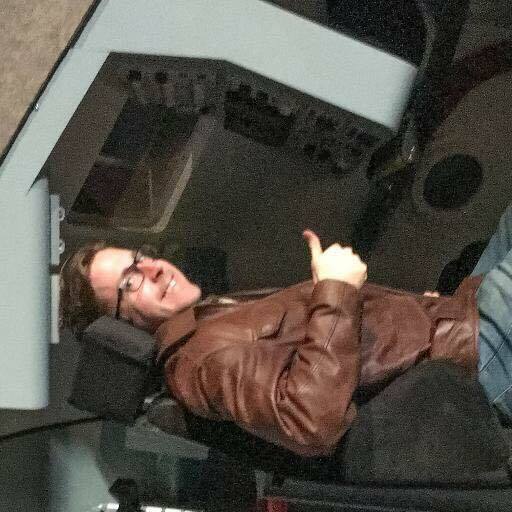 Stay tuned for more, and I’ll try and have one of these out for each episode!